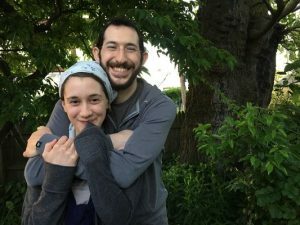 Rabbi Raffi and Ariella Leicht became the OU-JLIC educators at UMass Amherst in 2016. Raffi was born in Manhattan and raised on the Upper West Side and in Los Angeles, CA. After Manhattan Day School and the Marsha Stern Talmudical Academy (MTA), Raffi studied in Israel (Yeshivat Reishit, Aish HaTorah, and Derech HaTalmud) for two years. He studied in Israel and Yeshiva University for his Rabbinical education and studied neuropsychology at The City University of New York Baccalaureate for Unique and Interdisciplinary Studies and Hebrew University’s Rothberg International School. He has conducted research at Memorial Sloan Kettering Cancer Center and traded on the floor of the New York Stock Exchange, led Passover seders in Katowice, Poland and Flensburg, Germany, written for Tablet Magazine, created, edited and published two Jewish literary journals, organized concert series featuring Israeli musicians in New York City, and served as gabbai to chassidic rebbes. He is an alumnus of The Stollel and currently enrolled in the University of Purim. Ariella was born and raised in Great Neck, NY. After spending a year and a half in Israel at Sha’alavim, Ariella made her way to Stern College where she majored in Biology and History. With a Masters degree in Medieval Jewish History from the Bernard Revel Graduate School of Jewish Studies. Ariella has worked as an educator and assistant curator at Jewish museums across New York City and in Israel. Most recently as the Assistant Curator at the Herbert and Eileen Bernard Museum of Judaica at Temple Emanu-El on the Upper East Side of Manhattan, where she designed an exhibit on the history of Jewish wedding gowns and at the U. Nahon Museum of Italian Jewish Art in Jerusalem, Israel where she worked on their entire digital library. She has worked in retail at Anthropologie (partly for the staff discount) and at Amherst’s own Yiddish Book Center as the Membership Assistant.